*Galvanized steel strip core with interloked construction *Smooth Heavy Duty PVC sheath *Fully flexible with exceptional mechanical strength *Trade size: 1/4"~6"
Interlocking flexible liquid tight conduit is made from a helical ribbon of zinc coated strip, and externally coated in smooth and durable PVC. 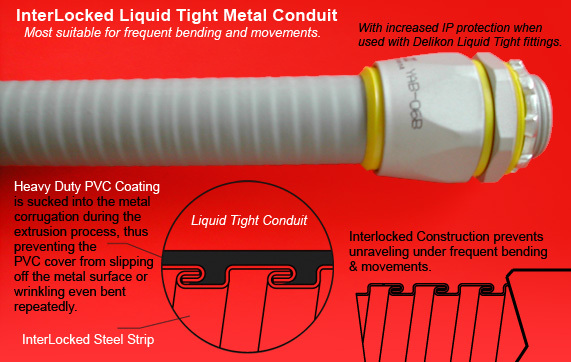 Resistant to most types of oils and greases, interlocked liquid tight conduit provides good flexibility and excellet mechanical resistance when subjected to traction stresses. Most suitable for industry machineries cables protection.